A life Jacket is a type of personal flotation device designed to keep a person's airway clear of the water whether the wearer is conscious or unconscious. They are either made from two layers of bonded polyurethane to be inflated or from foam. 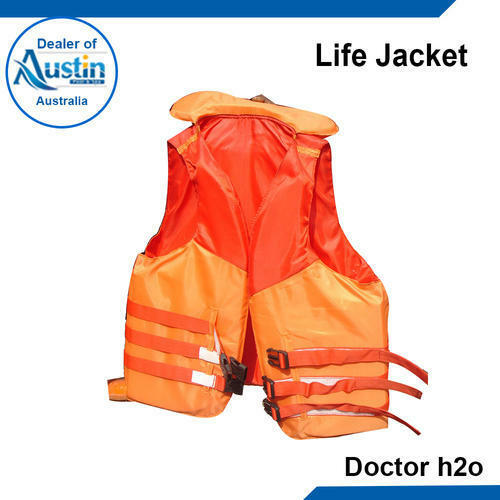 The inflatable lifejacket is probably the most widely used for both leisure and commercial activities, while the foam lifejacket is predominantly designed either for children, or for emergency use (such as on ferries, cruise ships etc). Established in the year 2002, we, "Doctor H2o" are one of the premier names in the domain of Wholesale Trader of Swimming Pool Equipment and Accessories. Our company is accredited and procures these products only from the reputed brands from across the globe. We offer our clients with various products such as Sand and Cartridge Filters, Domestic Water Treatment Solutions, Counter Flow Equipment, Swimming Pool Filtration Equipment, Ozonator, Swimming Pool Heaters, Pipe Less Filters, Swimming Pool Covers, Robot Pool Cleaners, Halogen and LED Lights, and Swimming Pool Ladders. Our range also includes other swimming pool products such as Competition Equipment, Life Saving Equipment, Swimming Pool Games, Suction Heads, Brush and Nuts, Swimming Pool Chemicals and Dispensers, Swimming Pool Inflatable, Steam Bath Systems, Sauna Systems, Jacuzzi Accessories, Chilled Shower Bath Systems, Water Treatment Chemicals, and Swimming Pool Furniture. With these quality products in our repertoire, we cater to the requirements of different sectors such as swimming pool, spa, and fountains. Our company also leverages on the support of experienced personnel from this domain who add to the expertise that we possess. These personnel enable us procure and offer our clients with products that is unmatched in quality. Moreover, owing to these attributes, we have garnered a huge client base and have set benchmarks for our competitors.